The body of YAMAHA MIO RETRO modifications done to the body using the Yamaha Fino, this are already a trendsetter in the year 2007. exhaust stem, taken from a Honda CB100 and the seat design also made the classic style. 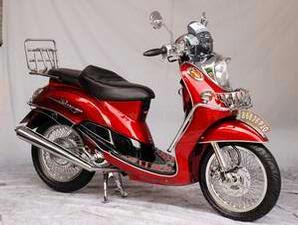 To modify the motor Yamaha mio retro require cost about 600 USD. Mio Low Rider Extreme Modification, more budget if you like to modified your bike like this. Yamaha Mio Low Rider Full Speed, full style, and full budged to modified your motorcycles like this scooter.